We can all do without the bitter cold days of late and the tragic event which unfolded in our very own neighborhood. Makes me want to shut the doors and not emerge until spring. Thankfully Izzy was shielded from the days events, having remained safe and warm in his school. At home, I chose to get a ride instead of walk to see friends, somewhat freaked out that such horrible things were occurring so close to home. I picked Izzy up from school and we stayed in all afternoon, building long train tracks, reading stories and doing a fun experiment. As the afternoon waned, I decided soup was what we needed and found everything I needed in the cupboard, including dried rosemary from our garden to canned chickpeas (great to have around for so many uses). While I was grinding the rosemary in the mortar and pestle, Izzy was puttering about in the living room. All of a sudden he let out a shriek to end all shrieks and was hopping up and down clutching his hand. He was crying and screaming so that I couldn't surmise what was wrong. I thought that the cat had bitten his finger and looked around for evidence, all the while asking what was wrong. Eventually I heard the words "staple" and "finger". He continued his shrieking, finally letting me see the staple sticking out of his thumb. I yanked it out and blood spurted out, more than one would imagine from such a small spot. A band aid and many hugs later and he was cured. Back to my soup...The recipe is forgiving and flexible..
1. Saute garlic cloves in olive oil until light golden. Add rosemary then tomatoes. Simmer for 20-25 minutes. 2. Add chickpeas and cook for 10 minutes. 3. Add broth and bring to a boil. 4. Add pasta and simmer until done. Add salt, pepper and water to suit taste. This can be thick and stewy or thinner and soupy. 5. Serve with grated cheese on top. Just one of the places he seems to feel right at home. I let him remain for the photo opp. but as soon as he tooted it was back to the floor. 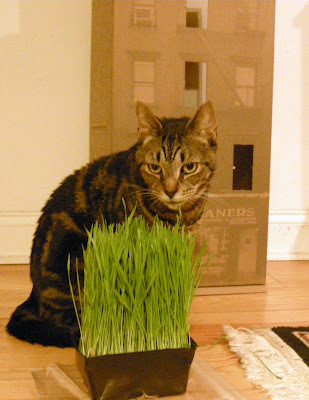 Did you know that "cat grass" is the same as wheat grass? Have you ever tried wheat grass juice? Years ago, during some health-foody phase, I ordered a shot of it. It wasn't exactly what I would call easily digestible. I think there is a reason that cows have two stomachs. Yet cats only have one and they seem to like it well enough. I picked this small tray up at the greenmarket for just $3 and was told it would last a few weeks. Pound cat took an immediate liking to it and comes around to munch a few times a day. Here's hoping it will help his digestion even though it did nothing for mine. Yes. I have taken to preparing baby food for my grandfather and I am thrilled. I loved preparing it for Izzy so who better for the job. 1. Heat oil in large pan over low heat. Gently cook garlic until lightly browned. Turn up heat to medium, add spinach and toss. Cook only a few minutes, until wilted and bright green. Remove to a plate and let cool. 2. In same pan, melt butter over medium heat. Reduce to low, add the flour and cook, stirring constantly for two minutes or until mixture is bubbly. Stir in milk slowly and whisk constantly, for five minutes until mixture thickens. Return spinach to pan, stir and season with salt, pepper and a scraping of nutmeg. 3. Allow to cool and puree in a blender. Spoon into ice cube trays and freeze. Remove the next day and store in plastic baggies or containers. These can be added to many foods, from mashed potatoes to mac and cheese, or just eaten as a side dish. It dawned on me Sunday that I had no plan for this historic occasion. Going to D.C. was never an option as standing around in the cold never appeals. I still wanted to do something to celebrate, something closer to home. I came up with attending the event held at the Eldridge Street Synagogue on the Lower East Side. I told Izzy that he could miss school and get to see Obama on a giant screen. I think it was more the screen than Obama that called to him but he agreed. It wasn't until Monday when he had had enough of weekending with me, that he changed his mind. He said he did not want to miss school. I was sad because even though he might not realize the magnitude of the inauguration now, he would one day hold the memory of what he had been doing today. It then occurred to me to find out what they would be doing at his school. When the reply came in that they would not be watching it, I was upset but unsure as to what to do next. Thankfully, at school drop-off this morning, other parents expressed an interest in having their children witness the ceremony. The parents spoke and the school listened. I received a call this morning, asking if I would host a group of children at my house. Montessori has a no t.v. policy but as a field trip it could be allowed. I was thrilled to oblige and began to eagerly set up the viewing area. Now I don't have a t.v. either but I do have a computer, which I attached to a large screen. When all was done, nearing to 11:15, my livestream CNN stopped working. It seemed stuck and I feared the children would arrive to see NOTHING. Panicked, I called my friend H. who saved the day. Instead of coming to my house, I traipsed with 16 children and 3 teachers over to H's, arriving just in time to catch Joe Biden being sworn in. The older children were able to remain relatively calm and attentive for a good 20 -30 minutes but the others were fairly antsy. It was hard for most of us to stifle a giggle when H.'s youngest daughter wandered in front of the t.v., sans undies, but somehow decorum was maintained. Overall, I was thrilled that I was able to watch with Izzy. After school, I invited his friend T. over and then realized we needed an appropriate snack. I whipped up some last minute OBAMA cupcakes which would probably have been better had I planned them in advance. The kids played in the snow happily and the day ended ordinarily. Will Izzy remember it....Only time will tell. The cold weather has brought in a spate of Chinese food and Izzy and I have begun to consider Grand Sichuan as our second kitchen. We seem to find ourselves eating food from there at least once a week. We are often on our way home from visiting Grandpa and it is a convenient, warm stop. Last week, as we awaited our order, Izzy was listening to the buzz of Chinese words floating around us. He turned to me to ask why he wasn't learning how to speak Chinese. I said I wasn't sure but that he was learning to speak French and Spanish. It was then he announced that he also wanted to learn Chinese. He explained that some of his classmates were learning it and that he wanted to as well. My first inclination was to refuse his request as I don't approve of over scheduling but he kept asking so I finally told him he could give it a try. 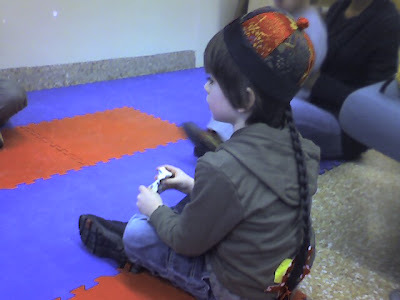 At his first class, the teacher promptly outfitted him with a traditional hat. He was captivated and despite the fact that he has French class immediately afterwards, he insists he can do it. He can already count past ten and he is excited for his next class. Who knows, if this all works out, one day he can take me to a restaurant in Chinatown and order for us in Chinese!! My friend Y., newly returned from a trip to Germany, called to inform me of all of the goodies she brought back. She was clearly itching to share some with us so I told her she could come by after Izzy came home from school. When I went to pick-up Izzy from school, I worried that he might be disappointed because his friend playdate had been canceled. As a consolation, I told him that Y. would be coming over for a "chocolate tasting". He took it quite well. In fact he was pleased. "She will be my playdate." For that matter, she would be mine as well. She arrived bearing a box of fancy chocolates and some homemade cookies her mother had made. 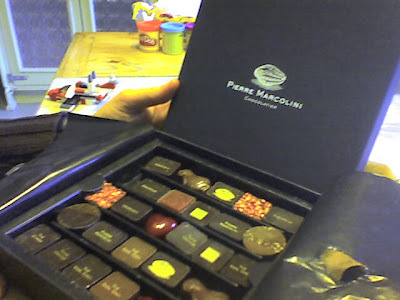 The chocolates were from Pierre Marcolini , a Belgian chocolatier. We selected a few different chocolates and she cut them into small pieces so we could try different flavors. There wasn't a dud in the bunch. From thyme-orange to raspberry, they were a real treat. I served crepes (post coming soon) and tea and we were all entertained. Izzy even got his playdate to help him build an airplane. We look forward to future playdates with my friend Y. And of course we may just have to try the chocolate playdate with one of his friends. I have been hibernating all week*, only emerging from my cozy nest to take Izzy to and from school. I did manage a mini-shopping on Monday but supplies are running low. The question is: Do I bundle up and brave the cold for farm-fresh eggs at Union Square or do I try to make the dozen I have last until next week and stay warm and toasty inside? The latter option sure is appealing considering it is supposed to reach a low of 7 degrees F. but we could also use some other foods to make it through the weekend and I am supposed to bring something to grandpa's. What is the answer? *Izzy heard me tell someone I was hibernating and he yelled out from the other room, "You can't hibernate. You are not an animal." Means no raspberry jellies for grandpa. I have long told of my grandfather's insatiable sweet tooth. It had gotten so that he was requesting four pound boxes of raspberry jellies at a time. We never did buy quite that much at once (at least I didn't) but he certainly had his fair share. Then about a month or two ago, his appetite diminished, not only for chocolates but for other foods. The two pound box of raspberry jellies sat forlornly on his counter, and each time I checked only a few candies had disappeared. I couldn't fathom why he wasn't eating them but eventually surmised it was related to his general lack of appetite. The good news is that lately, his appetite has returned so when we visited last week there were only two raspberry jellies left in the box. He gave one to Izzy and had the other one himself. And then I was sent, illico presto, to the chocolate factory to buy more. I suggested a two pound box and was told to get four. I was so happy with the return of grandpa's appetite that I figured this would be the occasion to indulge. I went off to Birnn Chocolates, only to find that they only had three quarters of a pound of raspberry jellies left. Not only that, they weren't sure when they would be making the next batch. It was hard to come up with soft chocolates as replacements. There are many fine choices but grandpa is a finicky chocolate eater. Would he like the hazelnut pralines or the peppermint patties? I had them prepare a pound of assorted chocolates to find out which ones delight. D. and S., the sweet ladies who work at Birnn, explained that there was an issue with one of the ingredients in the jellies. They were awaiting a new supply which was not forthcoming. D. then went on to explain the fate of another candy favorite, the raspberry cream. They only make those periodically as there is not enough of a demand. Apparently they are very difficult to make, using D.'s prized recipe. I asked her to contact me next time they make a batch as grandpa is fond of those too. Wouldn't it be wonderful if Izzy and I could take a peek at the next production? Mama and Pound Cat spend so much time snuggling and lazing about together that it's a wonder that Pound has any time for us. But of course the call of his cat dish and a scratch brings him down into our zone. Once in our realm, we shower him with love. Izzy can't get enough of him. The final CSA delivery of the season arrived during the last week of October. Long ago as that may seem, today I unearthed two remaining squashes in the back of my fridge. Sadly one ( a beautiful butternut) was long past its prime and had to be tossed but the other, a Sweet Dumpling, was still firm and perky-looking. I didn't want it to become another victim of procrastination so I took immediate action. I cut it in quarters and and slathered it with maple syrup and some excellent butter. I roasted it at @400 for about an hour. It was silky sweet and had a warm mapley aroma which filled our house. Izzy and I ate the whole thing. Here's looking forward to finding some more squash at the greenmarket, if there are any. Buying several cans of Campbell's Chicken Noodle Soup. Well actually it was but I tried to hide it beneath my organic milk, yogurt, cat food and toilet paper. What can I do? When A. is sick he craves foods that I wouldn't go near. When he asked for cans of chicken noodle soup last week, I brought home some cans of Whole Foods brand organic soup. I figured since I didn't have time to make any, the least I could do was buy something decent. Only they were not good enough (or shall I say bad enough) for him. He decided that the soup I had bought made him sicker and wondered why I just couldn't buy Campbell's. Truth is, they don't sell it at Whole Foods which was where I happened to be shopping that day. Since he has been sick for over a week, I finally caved today and agreed to buy exactly what he requested. And so it was that I found myself wishing I had shopped incognito, with dark glasses and a wig, as I wheeled my cart around filled with cans of icky soup. As A. likes to say, "It could be worse." I'd like to think it could be better and I hope to have some time to make him some homemade soup on Friday. I saw the tell-tale ponytail from behind and had an inkling of who was standing by the fish counter. 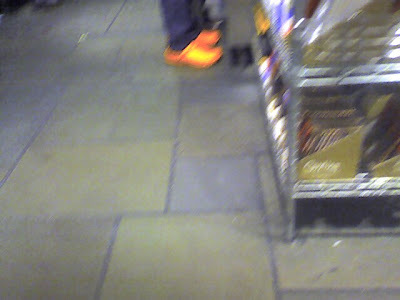 I looked down at the man's feet and when I saw his orange clogs they confirmed my suspicions: Mario Batali, accompanied by his son, was shopping at Citarella this evening while Izzy and I were doing the same. Not quite as titillating as my Nina Planck or Martha sightings but thrilling none the less. Oh how I do love grocery shopping in NYC..sure does beat Shoprite in JC. Mr. Cat, aka "Cat Pound", "Pound Cat" or Romeo, has been worming his way into our hearts for the past week. He and Mama have become inseparable. They sleep upstairs together and follow each other around the house. The Monsieur has a special meow reserved for her, and when summoned, she appears. She ventures downstairs regularly and has even taken to lounging on the steps. He is definitely changing her for the better. They even eat out of the same dish! I didn't realize just how attached they were until the other night. I went upstairs with laptop in hand, ready to get into bed and write. There I found Mr. Cat, lazing about in a cozy spot, smack in the middle of my bed. I climbed in anyway and he generously moved to the foot of the bed. A short while later, Mama appeared, she jumped to the opposite corner of the bed. She has never come near my bed at night so I remained as still as possible. As I typed, they inched closer to one another. When I was finally ready to go to sleep, Mr. Cat sidled over to my pillow. I have to admit, I felt slightly uneasy sleeping in bed with a wild cat and a cat I hardly knew. I watched with one eye open, as Mama crept closer to him. How touching, I thought. They were going to cuddle to sleep. As I soon witnessed, a cuddle was not at all what they had in mind. Instead I was an innocent bystander to what I shall politely refer to as "cat love". I was immobile in my own bed as those two felines became more than friends. When I could take it no more, I leaped from my bed to tell my husband who was up working. "What should I do?" I asked. His reply? "Tell them to shoo." I went back down to bed and thankfully they had done just that.